Every data mining project begins with defining what problem will be solved. I won't describe the CRISP-DM process here, but I use that general framework often when working with customers so they have an idea of the process. Part of the problem definition is defining the target variable. I argue that this is the most critical step in the process that relates to the data, and more important than data preparation, missing value imputation, and the algorithm that is used to build models, as important as they all are. 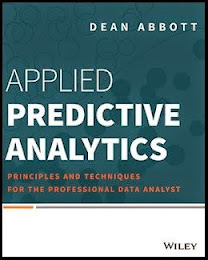 The target variable carries with it allthe information that summarizes the outcome we would like to predict from the perspective of the algorithms we use to build the predictive models. Yet this can be misleading is many ways. I'm addressing one way we can be fooled by the target variable here, and please indulge me to lead you down the path. Let's say we are building fraud models in our organization. Let's assume that in our organization, the process for determining fraud is first to identify possible fraud cases (by tips or predictive models), then assign the case to a manager who determines which investigator will get the case (assuming the manager believes there is value in investigating the case), then assign the case to an investigator, and if fraud is found, the case is tried in court, and ultimately a conviction is made or the party is found not guilty. Let's also put aside for a moment the time lag involved here (a problem itself) and just consider the conviction as a target variable. What does the target variable actually convey to us? Of course our desire is that this target variable conveys fraud risk. Certainly when the conviction has occurred, we have high confidence that the case was indeed fraudulent, so the "1"s are strong and clear labels for fraud. But, what about the "0"s? Which cases do they include? --cases assigned to a manager who never assigned the case (he/she didn't think they were worth investigating). --cases that went to court but was found "not guilty"
Remember, all of these are given the identical label: "0"
That means that any cases that look on the surface to be fraudulent, but there were insufficient resources to investigate them, are called "not fraudulent. That means cases that were investigated but the investigator was taken off the case to investigate other cases are called "not fraudulent". It means too that court cases that were thrown out of court due to a technicality unrelated to the fraud itself are called "not fraud". In other words, the target variable defined as only the "final conviction" represents not only the risk of fraud for a case, but also the investigation and legal system. Perhaps complex cases that are high risk are thrown out because they aren't (at this particular time, with these particular investigators) worth the time. Is this what we want to predict? I would argue "no". We want our target variable to represent the risk, not the system. This is why when I work on fraud detection problems, the definition of the target variable takes time: we have to find measures that represent risk and are informative and consistent, but don't measure the system itself. For different customers this means different trade-offs, but usually it means using a measure from earlier in the process. So in summary, think carefully about the target variable you are defining, and don't be surprised when your predictive models predict exactly what you told them to! Hey Dean, great post. Since you're interested in analytics for massive data and other predictive analytics topics, just wondering if you're familiar with Modern Analytics and their suite of cutting-edge solutions? This is such a great post and was thinking much the same myself. Another great update.